The formation in 1964 of the RUCIP EUROPEAN COMMITTEE, made up by EUROPATAT and the Co-operatives of the European Confederation of Agriculture (C.E.A. ), whose representative responsibilities had been taken over by INTERCOOP EUROPE, provided the justification for a new edition of RUCIP. This was taken in hand by the Committee who filled up various gaps that had become apparent through trade practice. However, RUCIP had been set up only for trade between countries and could not be used for transactions within national boundaries. 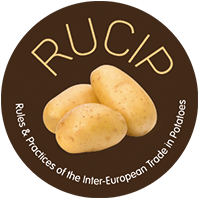 After the European Union of Potato Processing Industries joined the RUCIP EUROPEAN COMMITTEE in 1970, it was the common wish of these two organisations completed with the European Union of the Potato Processing Industries EUPPA, to standardise the different national codes, having in view a common European market and taking into account the developments in the economic situation of potatoes. This led to the revision of the Rules and Practices including the rules governing expert assessments and arbitration in 1972, 1986, 2000 and 2006. A profound revision was made and came into force on 1 March 2012. The most recent edition – RUCIP 2017 – focus strictly on the transfer of the European secretariat from Paris to Brussels and on the possibility to create European lists of Experts and Arbitrators for the countries that do not have a National RUCIP secretariat. It becomes effective on 1 January 2017.
who make up the RUCIP European Committee, recommend all their members to use the current Rules and Practices, and the Rules governing expert assessments and arbitration for their national, as well as their European transactions. The code name of these rules and practices – under which they have been tried and tested – remains RUCIP. National RUCIP secretariats are located in Belgium, Czech Republic, France, Germany, Ireland, Italy, the Netherlands, Spain, Switzerland and the UK.